With the arrival of 2012, our Sacramento automobile accident law firm welcomes the continued efforts of our state legislature to ensure the safety of our youngest residents. Among a number of laws that became effective when the calendar turned to January is a provision expanding the coverage of California car seat laws. Under the new legislation, children riding in cars in our state must be restrained in a properly installed booster seat until age eight. The law does make an exception for children under age eight who are taller than four feet nine inches. This is a significant change from the prior statue which required child restraints only until age six or until the child reached sixty pounds. As car accident lawyers for Sacramento and all of Northern California, our team at The Brod Law Firm has seen too many children’s lives impacted or even tragically ended by a car crash. Passengers not only rely on the safety of the person driving their vehicle but also on the responsibility and attentiveness of every other driver on the road. 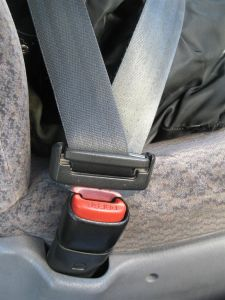 Proper seatbelt use is essential for all passengers, but especially for children whose small size and still maturing bodies make them particularly vulnerable. According to the California Department of Public Health, injuries in automobile accidents are among the top five causes of hospitalization and death in individuals under age sixteen. A study by the Center for Disease Control found that 179,000 children were injured in car accidents nationwide in 2009. The same study found 1,314 children under age fourteen died in car accidents that year. Further studies found that 8,325 lives were saved in a thirty year period due to the use of child restraints, numbers that don’t include the many more injuries prevented or limited due to proper child car seat usage. •	Rear-facing safety seats provide the best protection for very young children. Ideally, children should remain in rear-facing seats until age two. •	Front-facing child seats should be used until at least age four. •	Booster seats should be used for children under age eight who have outgrown a front-facing safety seat. These seats will ensure safety belts properly fit a child’s small stature. Children who remain too small for the regular seat should remain in booster seats even after their eighth birthday. •	Children should always be placed in the rear seat. This is especially important where the front-seat is equipped with an air bag, technology that provides added safety to adults but can be very dangerous to children. It is important that all child safety restraints be properly installed. Parents can contact their local highway patrol office to get professional assistance installing all forms of child safety seats. Many AAA offices also offer installation assistance. As always, our priority is safety and prevention. We urge all parents to comply with the new guidelines to protect children from harm in Northern California car accidents. Should an accident occur resulting in injury to you or your child, please contact our team so we can help you protect your legal rights and recover compensation to help your family pay injury-related costs and move ahead from the tragedy.